Ask any good trainer to recommend a great back and biceps workout that will show instant results and they are probably going to just smile and shake their head. The first and most important thing that you need to understand about working out your biceps and back is that like any other part of the body it requires desire, discipline and dedication. The 3Ds are the only way you can expect to attain back muscles and biceps that you will feel good about. The desire to be stronger and better built will fuel you with the energy and focus to keep to your workout program even when you may feel discouraged. The more you exercise your body, the better you will understand it and the manner in which it is built. Dedicated and consistent effort will pay off in the best way possible. Arnold Schwarzenegger, the man who set a new and unbelievable standard in bodybuilding, says that the link between the body and the mind is crucial. When you do reps of an exercise you should be able to feel the impact it has on your body. Hence, focus and concentration is essential when you choose and follow a biceps and back workout. Understand your body and go with a workout that is appropriate for it. If you are a beginner, then begin slowly, and stay steady. As you gain strength and muscle, add more sets to your workout. Building muscle is directly linked with your diet. You will need to eat a high protein diet when you follow a back and biceps workout. The nutrition you offer your body will help it recover well and gain maximally from the exercise. Pre and post workout snacks are important and cannot be missed. Do not expect results overnight. As in most things in life you have to work hard and be smart, and not look for shortcuts. Your body will not change overnight. However, as you make it work hard with every workout session, slowly but steadily you will be able to sculpt the form that you desire. Your body needs a 15-20 second break between sets. Short breaks, as compared to longer ones, lead to more release of hormones that facilitate muscle growth after the workout. Also, they improve blood flow to the part of the body that you are exercising and targeting. This increases the proteins that it receives and benefits from. You cannot rush through your reps if you want the optimal impact. There are no shortcuts and no hurried workouts that will help you build your body. Your trainer will tell you this again and again, and it is important that you pay attention to this important piece of advice. The initial few sets will feel easy, kind of like a warm up. As you steadily and effectively move through your workout, the muscles will start to feel fatigued. Do not give up now, it may feel like your body is sending signals for you to stop, but you need to ensure that you complete your workout properly. So you have heard of the 4X4 drive. The vehicle is powered by all four wheels and is in full form to move and get you to your destination. For your back and biceps workout, you need the 4X8 workout routine. What this essentially means is that you will be doing 4 sets of 8, and sometimes 10, repetitions of each exercise. For the start of the biceps and back workout, it is a good idea to begin with the exercise that you find the most difficult. There is nothing quite like facing your troubles and conquering them before you move on to the others. It is important that you understand your body’s capacity and your level of fitness and bodybuilding expertise. Do not hesitate to ask a trainer for advice if you have doubts or queries about an exercise. Instruction: Make sure your hands face away from you, and are apart shoulder width. If you are a beginner, if your gym has one, you can consider using a pull up assist machine. 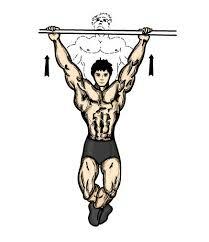 Most men like to begin with pull ups, remember to keep your hands wide apart. Pull ups exercise both your back muscles as well as your biceps. Try to get in 4 sets of 8-10 reps with a rest time of 20 seconds between sets. Do remember you will perform the exercise according to your level of fitness and strength. If you can manage to do only three or four repetitions, do not fret, focus on getting your form correct. will be able to slowly add to the repetitions in every set. 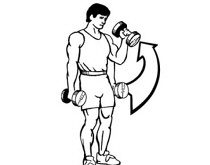 Instruction: This one focuses on the shoulders, middle back and the biceps. Make sure you are sitting comfortably and the knee pads are adjusted for your height. Grab the bar and ensure that your hands are spaced at shoulder width, this will give you a wide grip. Only the arm muscles will move and the torso is to remain stationary. 20 second breaks between sets. When you bring the bar down you will exhale. It should come down to the upper part of your chest. The strain will be experienced by your biceps and shoulder muscles. Do remember that your forearms are not meant to bear the strain, they are simply used to hold the bar and not to power the movement required for the lat pulldown. fully to slowly raise the bar. Instruction: This one focuses on stretching your biceps and back muscles without putting any strain on the lower back. Ensure that the machine is adjusted for your height. The chest pad ensures that your posture and form is correct. Start with a weight that you are comfortable with, and over the next few weeks you can increase it. 15 second breaks between sets. Rowing is an excellent exercise for the upper body. The chest supported row is an excellent way to stretch and strengthen those back muscles and biceps. An excellent option for folks who have lower back pain and need to avoid other exercises. Instruction: Keep your feet apart, shoulder width. 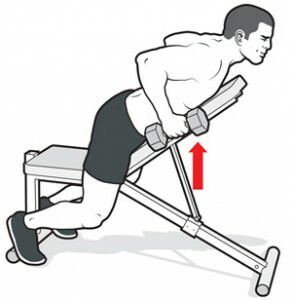 Bend with your knees to hold the bar. You will push with your hips and your knees too. As you rise up, the shoulder blades must pull together until the bar is at hip height. Lower the bar as you bend at the knees and look forward. Take 10-15 second breaks between sets. 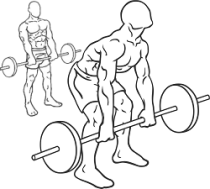 If you are a beginner and have no experience with the barbell, begin with no weights on. On the flip side, if you are going to pick over 110 pounds of weight, do wear a belt to avoid any risk of injury. 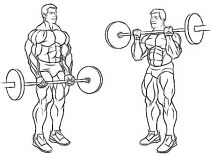 Instruction: Place your feet at shoulder width and bend from the knees to pick up the bar. 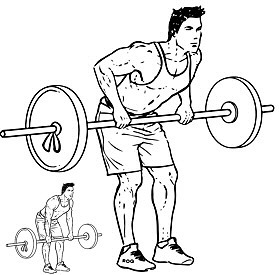 If this is the first time you are doing this exercise, do it without any weights on the bar. Form and posture is more important than the weight you are picking, that is until you have perfected the required movement. If you are using weights of more than 110 pounds, do wear a belt as a protection against injuries. Instruction: Stand with your feet apart, shoulder width. 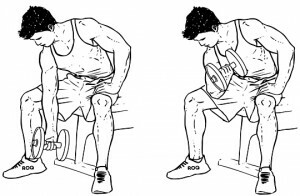 Do not bend your knees or flex your back as you raise the dumbbell to angle of 90 degrees. Your elbows should be angled towards your hips. 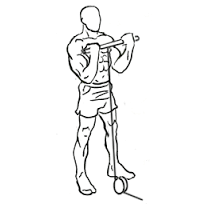 Pay attention to ensure that it is the biceps that are stretched and strained during this exercise. Stop between sets for a short break. Instruction: Make sure you are seated comfortably for this one and your feet are steadily placed on the ground. If you are exercising your right bicep then place your left hand on your left knee to keep you steady. The right elbow should be balanced on the right inner thigh. Now curl your arm so as to raise the weight. Your bicep will be squeezed tight. Do be careful not to follow a swing like movement and do the repetitions slowly and with conscious movement. Begin with a weight you are comfortable with, and after a few weeks you can increase it. Instruction: Keep your feet apart, flat and steady on the ground. Bend from the knees to pick the bar. Get a narrow grip on the bar as you raise it up. Take care to avoid straining your back and make sure your feet are flat during the repetitions. Take a short pause between sets. If you are a beginner to this kind of strength training, you may like to use a straight bar with a wide grip. 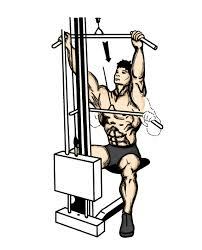 Instruction: For this exercise you can opt to use a straight bar or an ez bar. Seat yourself comfortably on a preacher bench. Make sure your back is straight and you place your arms over the pad. You will hold the bar with an underhand grip and slowly raise it towards your chin. The movement must be deliberate and should not be prone to bounce with the weight. A bicep workout requires focus and concentration. Ensure that you are not distracted while you exercise. Take 10-15 second breaks between sets to gain maximally from your workout. Instruction: This is a tough one, and sure to leave your muscles fatigued. So, get ready! Stand straight with your feet comfortably apart. They should be pointed slightly inwards. Position your elbows close to your body and keep them pinned. Hold the bar with an underhand grip and raise it to begin your biceps cable curl. Breathe in as you do so, and breathe out as you uncurl the muscles. Be conscious of the exercise you are performing and do not allow your body to move or swing. Your forearms will remain stationary and are not to facilitate the movement that this exercise requires. This one can be exhausting, so if you feel fatigued before you even begin, you may want to skip it. However, if you want to include it in your workout routine, make certain you do not get lazy with your posture or form. It is vital that you customize the biceps and back workout to suit your level of fitness and expertise with bodybuilding exercise. Slow and steady, this should be your motto when it comes to strengthening this part of your body. Any callousness on your part could strain your muscles and hurt them. It is a good idea to work with a trainer until you are confident of each exercise and are able to do them effectively. Do pay heed to the signs that your body offers you and do not overdo the exercises. Remember to take breaks between sets and to enjoy your workout routine. Take care to eat or drink pre and post workout snacks that are rich in proteins. Finally, the 3 Ds, desire, discipline and dedication are the foundation for a great workout and towards achieving your bodybuilding goal. It will also help you become more attuned to your body and its capabilities.